Mira! El Facebook De Shaggy! I am completely floored and shocked by the news of the sudden passing of the great poet Louis Reyes Rivera on March 2, 2012. Louis was an unsung hero and a true revolutionary poet. 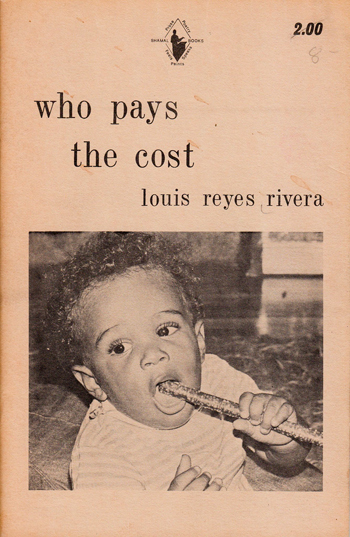 A bridge between the African, Pan-American and Latino Diaspora, Louis was in the tradition of Luis Pales Matos and Nicolas Guillen in that he identified with his African roots. 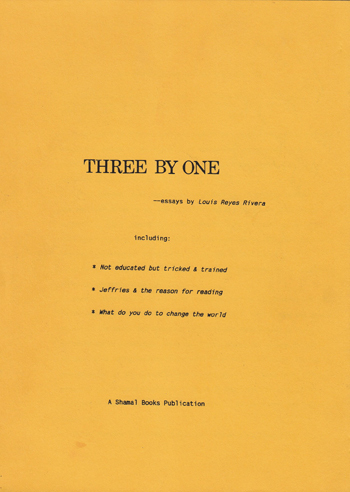 He was a major poet of the post-Black Arts and Nuyorican traditions who, as publisher and editor of Shamal Books, published many of the poets who came of age directly after the Black Arts generation. He first published poets like Sekou Sundiata, Rashidah Ishmaili, Sandra Maria Esteves, Baron James Ashanti, Safiya Henderson-Holmes and Zizwe Ngafua, to name a few. He even published the work of his father-in-law, the great John Oliver Killens. Louis was a tireless cultural worker who mentored and fostered many writers into print as editor and workshop instructor. He was also a radio talk show host who explored the socio-political and cultural work of artists of all disciplines. Louis led a band called The Jazzoets at the famed Sistas’ Place in Bedstuy Brooklyn. It was also there where he held countless workshops helping to publish numerous writers to the selfless neglect of his own work. A college professor for many years, Louis was a historian who held court in and out of the classroom and held his students (and disciples) transfixed with his encyclopedic knowledge of African, Caribbean and African American history and politics. When I first started reading my work in the New York City poetry and activist community, it was Louis and the great Rev. Pedro Pietri who I first read with in one particular venue in Harlem hosted by S.E. Anderson. I was so nervous that I was reading with two of my main poetic heroes, but the two of them embraced me and welcomed me into the fold after reading for the first time what became a signature poem, “Capitalism Is a Brutal Mother*&%er.” I was welcomed among the most radical and dynamic poets who were throwing down since the 1970s and that they were also two Black Puerto Rican communists that came out of similarly impoverished backgrounds as I did, was a major jolt to my sense of self and confidence as a young, emerging political poet. Of course, I read all of Louis’ books and was excited for the major work he recently completed and was about to publish, which was a jazz epic in poetry. Louis was an incredible spoken word artist as well. He would read these long epics totally from memory and completely and utterly blow up the spot and leave a giant hole in the stage. After a big reading we had at Borough of Manhattan Community College, I asked him how he memorized all of that, he said, I always look for the music in the poem. ‘Til this day, I could never memorize such lengthy poems. Louis was truly an amazing artist whose work has not garnered the attention and acclaim it deserves. 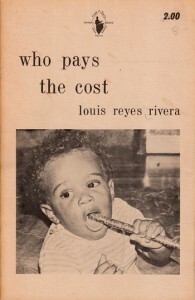 But in the activist and cultural communities, particularly in New York, and among those poets of his generation and mine, who are in the know; know that Louis Reyes Rivera is/was a major poet and writer. His keynote speeches at The Black Writers Conference at Medgar Evers College, CUNY, in the 1990s alone, have influenced a new generation of poets, writers and activists who found n his work and commitment an example of an artist and witness of the utmost integrity and dedication to the people. A child of the Marcy Projects in Brooklyn, Louis was known as “The Janitor of History.” He was an artist who so identified and championed the working class and oppressed everywhere. 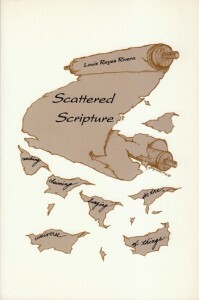 This was made clear in his seminal volumes of verse, Who Pays the Cost?, and the epic Scattered Scripture, which I hold dear and find myself dipping into every now and again. 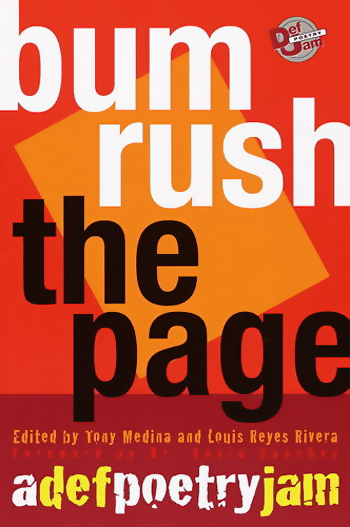 I had the honor to work with Louis on the anthology Bum Rush the Page: A Def Jam that was published by Random House. We were invited to edit the book by one of his mentees, the poet, editor, filmmaker and creator of Def Poetry Jam Bruce George. In those weeks and months we worked on Bum Rush, Louis would make the trek each day from Brooklyn to my crib in Harlem and we would spend the better part of the afternoon reading and sifting through poems while he would tell me these great stories of the poets and the scene from back in the day, that good old behind the scenes literary gossip and oral history where you really learn beyond any old academic workshop environment. One such anecdote was the story he told me after my prompting of how he met his wife and life partner Barbara, who is the daughter of the great novelist and activist John Oliver Killens. I was transfixed as he told me Nikki Giovanni, who was her dorm mate at Fisk University in the 1960s, introduced him to Barbara. Like a griot, he unfolded literary history to which he was a major stitch in the fabric. I had a front row seat to a seldom heard and relatively unknown story of Black literary history. Those were some good times and I am profoundly proud that I got to work with such a seminal professional and tie my name to his in literary history. We put together what we felt was a revolutionary and wide-ranging collection of contemporary poetry that we tried to the best of our ability to make as inclusive and representative (in terms of generation, ethnicity and aesthetic as possible). The last time I saw Louis was at Amiri Baraka’s 75th birthday celebration at the Schomburg in Harlem that was organized by the poet Ted Wilson whose first book of poetry Louis recently published. We sat next to each other and he looked good as ever and it did not seem as if he aged from the time we worked together on Bum Rush nearly ten years earlier. He read an excerpt from his new manuscript. I remember him being very excited about this new work and how he wanted it to be published by a major press that would give it the attention and care it deserved. My deep sense of grief and condolences goes out to Louis’ wife Barbara, their children, his family, friends and comrades in the struggle. We really lost a true giant and a tireless cultural worker whose every breath and movement in this capitalist beast of a stolen land we call America was his undying dedication, devotion and love of the people. 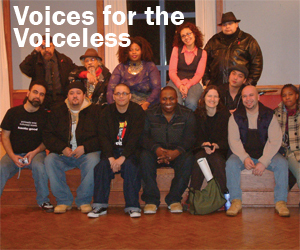 Louis’ work will carry on in the books he left us and in the Louis Reyes Rivera Lifetime Achievement Award™ founded by poet and activist Shaggy Flores (another of his mentees) for The Voices for the Voiceless™, a poetry festival and conference that is close to fifteen years now. Godspeed, my friend, big brother and comrade. You leave behind giant shoes to fill! I can hear you know shouting out at us from the Spirit World—MANTECA!!!!!!!!!! 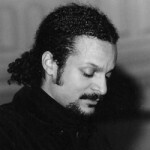 Tony Medina, two-time winner of The Paterson Prize for Books for Young People, is the author/editor of sixteen books for adults and young readers, the most recent of which are I and I, Bob Marley; My Old Was Always on the Lam (2011 Paterson Poetry Prize Finalist); Broke on Ice; An Onion of Wars; and The President Looks Like Me and Other Poems. He divides his time between his New York City hometown and the Washington, DC, metropolitan area where he is the first-ever Professor of Creative Writing at Howard University. February 18, 2013, Comments Off on Respect to Truth Thomas! As one of the poets who has worked to reinvigorate the Nuyorican poetry movement in recent years, Shaggy Flores brings a scholarly attitude to what he refers to as cultural work. He sees poetry as a way to simultaneously inspire people and educate them. For him poetry is a vehicle to dismantle stereotypes and damaging myths and to share knowledge of music, Puerto Rican culture and traditions, urban culture, the political movements of the 60s and 70s, African cultural traditions and black history in the Atlantic. Copyright © 2011 - South of Harlem Multimedia. All rights reserved.